It’s been a while since I posted anything that wasn’t related to Salesforce, hasn’t it? Here’s something a little different, but still cheerleading technology and tools I like, which I used to do a lot more of. Over 3 years ago, I wrote a blog post about my quest to find decent project management software for Fight Colorectal Cancer. That post was quite popular for a while and still gets a fair number of page views. Commenters either sympathized, or used the post’s page rank to promote their own wares. Right around the time I started at KELL Partners last year, I helped our team implement Smartsheet as our main tool for keeping track of timelines, requirements and deliverables with clients and internal projects. Truth be told, had Smartsheet existed in this form 3 years ago, I wouldn’t have been so frustrated. It meets all the requirements I mentioned in that post and then some. Yes, some of what we’re doing in Smartsheet could be done in Google Docs. But aside from the fact that KELL doesn’t use Google Apps so documents wouldn’t be centralized and owned by the company, Smartsheet does so much more than just flat spreadsheets. Every time I use it, I find some cool new way to make it work better. What is Smartsheet? It’s an Excel/Google Doc-like online app that generates spreadsheets that are more dynamic than just rows & columns. In addition to spreadsheets, there’s quite a bit of Microsoft Project thrown in (it can even import Project files). The interface is very simple to learn and use, which makes it ideal for sharing with clients of all technical backgrounds. You need a paid account to create sheets after the free trial expires. But those sheets can be shared with anyone, either through a named user or through a publish link that anyone can view if they know it. Here’s why I think Smartsheet is a better choice than Google Docs for team collaboration, so I can just point to this post in the future. Task dependencies – The kinds of projects we do don’t lend themselves to Agile project management – we need good old fashioned waterfall tasks and Smartsheet makes that easier to maintain. Enter the expected duration and the predecessor task and the start/finish date automatically calculate. I only wish I had the ability to lock a date like you can do in Microsoft Project. I often have to be careful that slipping predecessors don’t cause hard & fast dates to slip as well. Collapsable rows – Rows can be nested underneath each other. This is particularly helpful on timeline sheets, because those parent rows can be used as a predecessor themselves without anyone manually having to update its values. If there are 5 sub-rows, another task can be set to start after the finish date of all 5 rows taken in combination. Durations, start and finish dates roll up to the parent. Templates – Any sheet can be saved as a template. This is particularly helpful on timelines for similar projects where the durations and predecessors are already set. Just need to change the starting dates and everything falls in place. We also have templates for requirements and discovery documents, configuration checklists and more. When a new project starts, it only takes a few minutes to assemble the right templates, edit for the particular client and be ready to go. Easier picklists – I don’t know about you, but I can’t stand the way Excel and Google Doc make you select ranges from cells as part of a data validation rule in order to make a field as a selection choice for users. I’d much rather just define the column’s picklist values and be done with it. 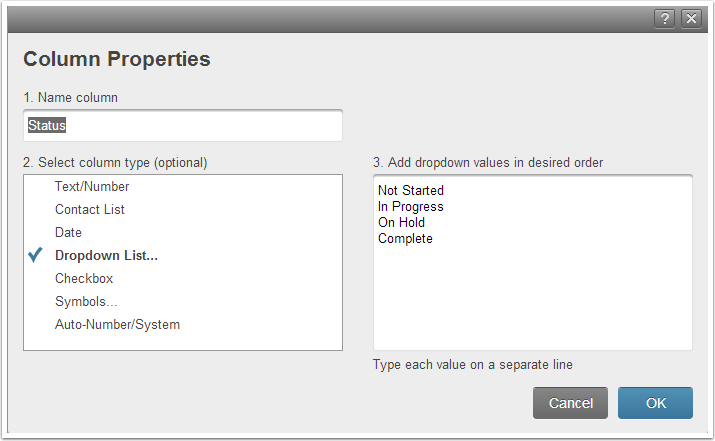 On demand and scheduled backups – I wish Smartsheet had version control, but this will do for now. Like Salesforce, every workspace (a collection of sheets & folders with common sharing settings) can be set to download a complete backup of all enclosed sheets on a weekly basis. Like Salesforce, the backup is a .zip file of Excel files that can easily be used to restore data in case of loss or damage and is emailed to the person who requested/scheduled it. Discussions are focused – I don’t feel like my time is wasted when I’m reviewing what has changed or needs attention in a Smartsheet compared to the amount of banter, fluff and chit chat I have to sort through when I log in to Basecamp. Finally, the company’s support of their product has been excellent. They respond to tickets quickly and are frequently keeping their blog updated with tips & tricks. I also appreciate that they publish and update a roadmap document. Ironically, the one feature of Smartsheet we don’t currently use is the Salesforce integration. For us, it’s easy enough to keep it separate and just include a link to the project workspace on the record. Thanks, Judi! I can’t help but think that this post was somewhat inspired by our tweet exchange on Friday, and it’s timely for me, because we just started evaluating Smartsheet. Like you, I have lots of angst about Project Management tools, and I’ve spent far too much time trying out apps that don’t do what I need. At this point, I’m fairly certain that there is no such thing as a PM app that does it all, so we’re going to end up with three of them. This is for a few reasons: we are both an agile and a waterfall shop. I oversee systems/support staff and developers. My developers do agile — currently with a somewhat cheesy PHP freebie, but we’re seriously considering JIRA. For our high level communication around projects and status, we are loving Trello, a clever Kanban board that I blogged about here: http://tig.lsc.gov/trello-swiss-army-knife-tasks-prioritizing-and-project-planning. We use it to keep track of current and upcoming projects, for meeting agendas, for task management (those of us who don’t need JIRA-style task lists) and other purposes. But this still left a gap for the more detailed planning that I need to do, with milestones and dependencies and all of that waterfall stuff. I have been accused of being a geek for publicly stating that I love GANTT charts; I own that! But I’ve also been a victim of having one major project get seriously creamed when deadlines for another major product got pushed beyond reason by an incompetent integrator (no one you know). So I never want to set out on an ambitious scope of work (as I’m doing at LSC) without an overall GANTT that I can use to measure the cross-project impact of particular project variances. Smartsheet seems to do this really well. So, here, Trello/Smartsheet/JIRA might be the best of breed combination that meets my needs. It would be great to use just one app, but I’m a very, very certain that such an app doesn’t exist. Hi Peter, thanks for the comment! I had been thinking about blogging about Smartsheet for a while now. But I do admit our little Twitter exchange was a motivator to do it once and for all. I looked at Trello a while back, and ended up settling on a combination of Remember the Milk and Evernote/OneNote/Salesforce custom objects to do similar things. I’m still looking for that one-app nirvana myself. Wow Judi – thanks for the thorough review of Smartsheet! Glad it’s a great fit for your collab & project management needs. Glad Smartsheet is working for you and the team. Appreciate the ‘wish it had’ comment as well re: locking dates — good to know. I hope you find value in the project management capabilities we’re adding over the next few months. Resource management (resource allocation, over-allocation prompts, and cross-project resource views) should add another helpful layer of visibility. Thanks for using Smartsheet and for sharing your experience with others. Piling on… We are also working on making Smartsheet play well with other apps, and I would love to hear about any specific integration scenarios (Smartsheet to JIRA, or Smartsheet to Salesforce) you or others looking to address. Project managers love this unique task board optimized for teams. Matthew Osborne created this project management system because my clients demanded it. He has developed a search function that worked effectively. online project management software. It’s good to hear that Smartsheet is coming along. We have been using Dooster for about three years and it was always good but also like Smartsheet Dooster.net is continually improving. Smartsheet is the good tool to use. Many other project management templates are available online. One has to choose among the best considering the needs and wants.